FILE - Allen Toussaint performs at the New Orleans Jazz and Heritage Festival in New Orleans, Louisiana, May 7, 2011. Allen Toussaint, one of the legendary names of New Orleans music, has died in Madrid at the age of 77. The piano master, known for jazz, R&B and blues and who wrote hits such as "Working in a Coalmine" and produced Patti LaBelle's famous cover of "Lady Marmalade," died of a heart attack on Monday evening after giving a concert at the Spanish capital's Teatro Lara, hospital officials said. Fans posted videos of Toussaint's final performance on YouTube, while the English singer and songwriter Billy Bragg said on Twitter: "The man was a genius." Toussaint, who began performing in his teens, collaborated with a wide range of artists, including John Mayall, Bonnie Raitt, Elvis Costello, Lee Dorsey, Paul McCartney and The Band. He did the horn arrangements for The Band's famed final concert filmed by Martin Scorsese as "The Last Waltz." Many of his songs became famous in cover versions by The Rolling Stones, The Who, Robert Plant, Bo Diddley and others. In addition to writing a string of hits, including "Southern Nights" and "Fortune Teller," Toussaint also campaigned and raised funds to help New Orleans recover from the devastation of Hurricane Katrina in 2005. 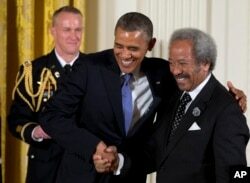 FILE- President Barack Obama welcomes Allen Toussaint to award him the 2012 National Medal of Arts for his contributions as a composer, producer, and performer, during a ceremony in the East Room of White House in Washington, July 10, 2013. President Obama praised Toussaint's efforts in 2013 when the musician was awarded the American National Medal of Arts, saying: "After his hometown was battered by Katrina and Allen was forced to evacuate, he did something even more important for his city, he went back and since then Allen has devoted his musical talent to lifting up and building up a city." Toussaint said in an autobiographical item on his website that he began playing the piano when he was about six years old when an old upright piano was brought into the family home for his sister, who quickly gave it up. "Our upright wasn't much of a piano - it was a half-step flat the entire time we owned it - but that piano was everything to me. It was dark mahogany, almost black, with rouge crimps all over it. I took about eight piano lessons before my teacher gave up on me. I loved boogie-woogie and hillbilly music and gospel too much," Toussaint said on the website. He said he became deeply involved in playing when he heard New Orleans blues singer and piano player Professor Longhair, and with the radio near the piano, began playing everything he heard. Toussaint died on Monday after being taken to the Madrid hospital Fundacion Jimenez Diaz shortly after his performance on Monday night, officials said. He had played in Bilbao on Sunday and was next scheduled to perform in Antwerp, Belgium, on Nov. 12 as part of his tour "Evening with the Allen Toussaint Trio." He is survived by his son Clarence and his daughter Alison.